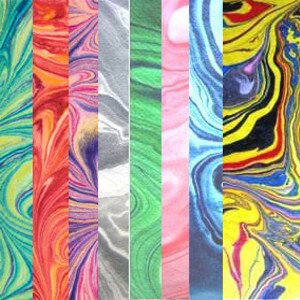 Marbled & Painted handmade Saa papers are all individually hand created by an artist, No two sheets are ever the same. Good for screens, wallcoverings, crafts and a multitude of projects requiring a truly individual paper. These handmade paper are made by traditional techniques using a teak wood mould/deckle. Handmade papers take the size of the mould and have four deckled edges. Due to the uneven quality of deckled edges, the dimensions of each sheet of handmade paper will vary slightly - typically up to 1cm. A note on cutting handmade paper to smaller sizes with straight edges: please allow about 2cm (1") all around the sheet for trimming to straight edges before cutting. Pricing subject to handling and delivery charges. Please email / fax / phone your orders. Visa, Mastercard or American Express.